Signe Wilkinson of the Philadelphia Daily News.........Thanks Signe!! Believe it or not, painting those stripes costs upwards of $1000 per mile. 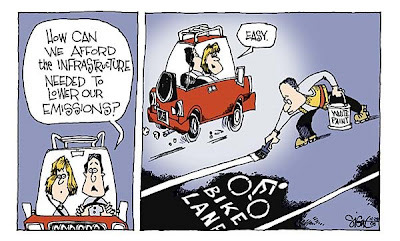 It's a lot cheaper than adding more traffic lanes, but it's still an expense. Proper maintenance of bike lanes adds to the expense. Are you serious? $1000 per mile is peanuts for transportation infrastructure!! I would expect it to be more and still call it the transportation bargain of the all time. It is such great bang for the buck that fiscally strapped cities that "get it" (like Berlin in the 1990's) have focused on bike infrastructure instead of much, much, much more expensive mass transit metro systems, etc.